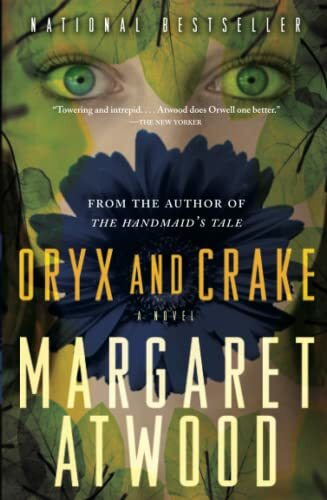 Oryx and Crake is at once an unforgettable love story and a compelling vision of the future. Snowman, known as Jimmy before mankind was overwhelmed by a plague, is struggling to survive in a world where he may be the last human, and mourning the loss of his best friend, Crake, and the beautiful and elusive Oryx whom they both loved. In search of answers, Snowman embarks on a journey-with the help of the green-eyed Children of Crake-through the lush wilderness that was so recently a great city, until powerful corporations took mankind on an uncontrolled genetic engineering ride. Margaret Atwood projects us into a near future that is both all too familiar and beyond our imagining. "In the beginning, there was chaos..." Margaret Atwood's chilling new novel Oryx and Crake moves beyond the futuristic fantasy of her 1985 bestseller The Handmaid’s Tale to an even more dystopian world, a world where language--and with it anything beyond the merest semblance of humanity--has almost entirely vanished. "A delightful amalgam for the sophisticated reader: her perfectly placed prose, poetic language and tongue-in-cheek tone are ubiquitous throughout, as if an enchanted nanny is telling one a dark bedtime story of alienation and ruin while lovingly stroking one's head." -Ms.